Striker Sam Vokes joined up with Wales after his winner at Southampton on Saturday - and hopes boss Sean Dyche will still be Clarets boss on his return. Boyhood Saints fan Vokes netted nine minutes from time at St Mary’s with a stunning header from a Johann Berg Gudmundsson cross. It was his first goal since a brace on the opening day at Chelsea, and now he joins Wales for friendly games against France on Friday, and Panama four days later. Asked if he hopes Dyche will still be at Burnley, amid continued speculation linking him with the Everton job, Vokes said: “Of course. “The gaffer deserves the recognition he’s got, he’s done brilliantly in the five years he’s been here. “It’s what happens, the big clubs come looking. Vokes has been with the club throughout Dyche’s reign, having been signed by Eddie Howe on a permanent basis, after an earlier loan spell, in the summer of 2012. 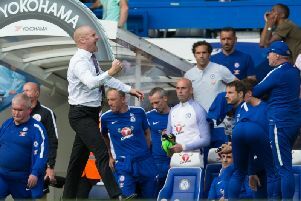 And he feels Dyche has transformed the club: “Our status as a Premier League club is there to see, and it’s not just on the pitch, it’s off it. “You look at the club and it’s changed, the training ground, the facilities - we’re a proper Premier League team now and you feel it every day coming into work. “It is a culture, it’s something all the lads buy into. Players inevitably hear and read the speculation, and Vokes added: “It’s part and parcel of football. It’s always going to happen, if you’re doing well you’re going to be linked with places. He accepts it would be a big blow if Dyche leaves, but the squad would hopefully continue the good work: “It’s ifs and buts, the gaffer has been fantastic here, but I think the squad we’ve got here is strong enough to sustain it.